My departure gate in the Atlanta airport today is located right next to the B concourse “Smoking Lounge.” I realized it when I walked past just as someone exited the room and I caught an unmistakable whiff of cigarette smoke. It’s not much of a “lounge, ” really — just a spartan room where smokers can gather cheek by jowl and puff away like mad. It seemed like everybody in that room was trying to inhale as much smoke as they could, as fast as they could, and when they walked out they reeked of smoke. It reminded me of the “teacher’s lounge” in high school, where any teacher walking out would trail a cloud of smoke. It’s kind of weird to see a Smokers Lounge in an American airport in our modern, anti-smoking world. 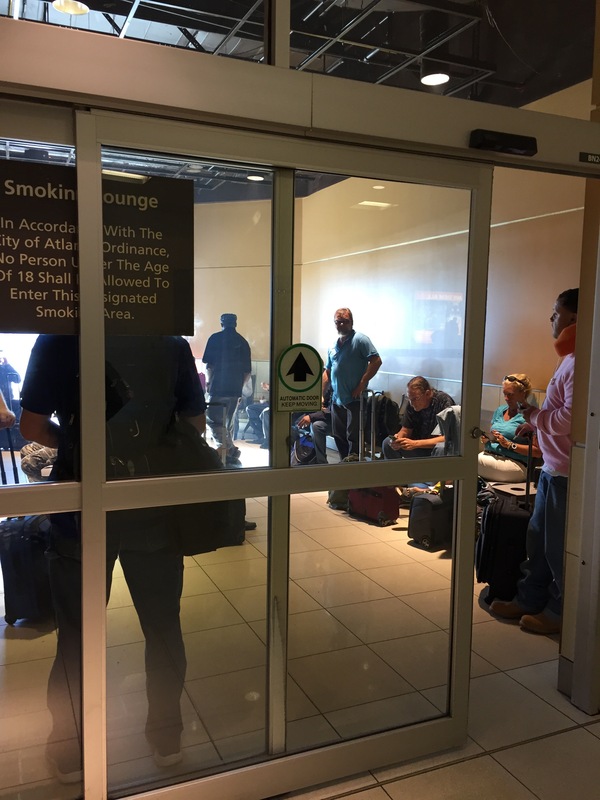 This entry was posted in America, Travel and tagged America, Atlanta, smoking, smoking lounge, Travel by webnerbob. Bookmark the permalink.